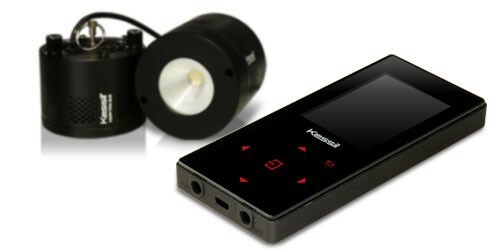 This is the answer on how to easy run you Kessil lamps and have full control at you finger tips. With the spectral controller you will be able to within minutes. From the controller you can even run 2 different systems if you should so choose or group your lights in 2. There are no issues trying to connect wirelessly you will simply put in a plug directly into you master light and you are in contact. With the quick set menu you can set up dusk-dawn effects throughout 6 different time points. The Spectral controller is compatible with the 160 and the 360 series. Discon Fiberoptics (Kessil) has been one of the leading manufactures with in the Led Light game. Where the lights from Kessil really stands out are in the quality of product and also if we look closer at the Led chip. Most conventional Led lights will be utilizing mainstream led diodes. All the Led chips that goes into the leds from Kessil are made at their own factories in Taiwan, the chip is a breed of its own and patented. All of the E-series models has a lower power consumption and are 15% brighter. It is recommended to hang you Kessil WE unit 40 cm above the surface in order to optimize the spread. Kessil A360NE Tuna Blue (2) + Spectral Controller has not been evaluated yet. © Copyright 2019 Aquadepot Europe. All rights reserverd.